I have always been intrigued with sourdough, but just a bit intimidated at the prospect of it all. What I have learned this past year is just how easy it is to get started and keep it going. My biggest fear was the starter. I wasn’t sure if I could keep it ‘alive’ and just how attentive was I going to have to be with it. Well, let me tell you, it is very forgiving to say the least. I developed a starter, used it a couple of times, and then kind of forgot it in the back of my refrigerator. I neglected to ‘feed’ it like I read I was suppose to do on a weekly basis. It turned into a separated and not too appealing jar of glop and dark brown liquid…..not too appetizing I might add. I learned this is normal and the dark liquid (called hooch) can just be stirred in or poured off. I poured it off because it isn’t very pretty! I smelled the remaining paste (that’s what it looked like anyway) and it had a pleasant yeasty/sour smell, not at all unpleasant. So, I fed it……and it was HAPPY! It bubbled and grew – I didn’t kill it. That was a year ago and I have now learned just how forgiving and fearless it all is. My sourdough starters (yes plural) have evolved. I have done three different methods – dehydrated sourdough starter (http://carlsfriends.net/), starter made with pineapple juice and flour (http://www.breadtopia.com/make-your-own-sourdough-starter/), http://www.ehow.com/how_2300269_make-sourdough-starter.html and probably the BEST sourdough course of all http://gnowfglins.com/ecourse/members/ecourses/sourdough has excellent instructions and recipes. I have taken a little from each and have come up with the starter that works the best for me. Stainless or wooden spoon for stirring – just don’t use aluminum, copper, brass. Water – Chlorine free – Mineral / Spring water is good. But instead of purchasing water, I have found that using regular tap water that has been set out on the counter uncovered for at least 24 hours works perfect. If you forget to set out some water (gee, how do I know this?) you can boil the tap water for 10 minutes and let it cool to room temp before using. The first day: Put 1/4 cup flour and 3 Tbls. water in jar. Stir well and scrape down the sides as well as possible. Cover loosely (do not seal) with plastic wrap or cotton cloth (not cheesecloth). Let sit 24 hours at room temp. If your kitchen is on the cold side, you can place in your oven with the light on. I find it does best between 70 -75 degrees. 1st feeding: add another 1/4 cup flour and 3 Tbls. water. Stir well incorporating air into the mixture. Scrape sides, cover loosely, and set on counter for 12 hours. 2nd feeding: 12 hours later, check for any signs of ‘life’. You should see bubbles, they may be tiny. If there are no bubbles by now you will need to dump this out and start over. If there are bubbles, continuing feeding your starter the 1/4 cup flour / 3 Tbls water stirring well each time. You can add a little more water if the starter seems too thick. The consistency of a pancake batter seems to be about right. 3rd – 7th feeding: at least every 12 hours you will continue feeding BUT remove 1/2 of the starter at each feeding and discard. This will make a strong starter. At about the 4th feeding, I change the type of flour. I alternate with white whole wheat and spelt or occasionally all purpose flour. Although it is not necessary to do this, I find my starter is much more active when I do this. Your starter should begin doubling in size with each feeding. Once your starter is one week old it is ready to use! At this point you can keep the mature starter out on the counter, between uses, or in the refrigerator. If you are using your starter regularly and leaving it out on the counter, you will need to feed it two times a day. If refrigerating your starter, try to remember to feed it at least once a week. 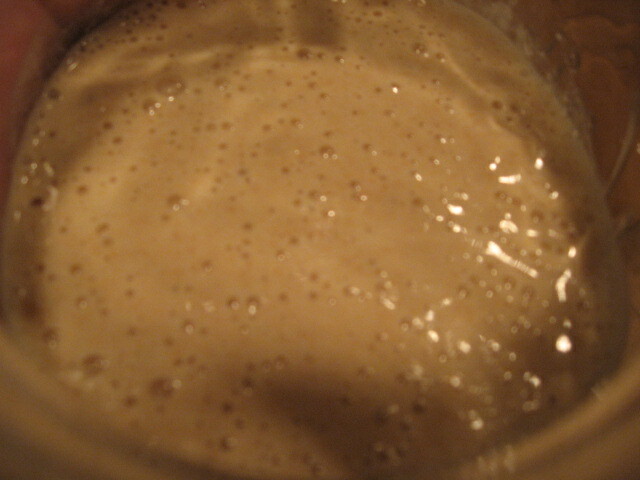 If you are not ready to use the starter, pour off half, feed, and let it sit out at room temp and let it start bubbling. Once the active bubbling has subsided, cover with a lid and put back in the refrigerator. Don’t tightly cover an active starter. For a New Starter: Don’t increase the volume of your starter by more than double in one feeding. Once it has been used and has matured, tripling the volume would be fine. Change out the jar every couple of feedings to prevent dried starter on the sides of the jar and prevent mold. If you are fermenting / culturing other items in your kitchen (kombucha or dairy cultures) keep them at least 5 feet apart. You don’t want to cross the molds that ferment each. I use my oven to keep them separated. Important: when using your starter in a recipe, always keep at least 1/2 cup as your starter culture. You don’t want to have to start the process all over again. Make sure you have enough active starter and build up the quantity you will need for your recipes.